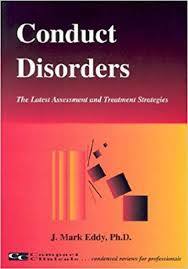 Conduct Disorder research papers examine the psychological disorder characterized by a persistent pattern of antisocial behaviors. Conduct disorder is a psychological disorder of children and adolescents, characterized by a persistent pattern of antisocial behaviors and is often seen as a precursor to antisocial personality disorder, a condition that is not diagnosed in individuals under the age of 18. According to the Diagnostic and Statistical Manual of Mental Disorders (DSM-IV), conduct disorder is diagnosed after a prolonged period of norm violations and is often, but not always, the result of substance abuse. Paper Masters will compose a custom research paper on Conduct Disorder that follows your guidelines. According to the DSM-IV, there are two potential course of development for conduct disorder. The first, called “childhood-onset type,” presents before the age of 10 and is marked by higher levels of ADHD behaviors, academic problems, family dysfunction and higher rates of aggression. The second type is known as “adolescent-onset type” and frequently held to be an exaggeration of typical adolescent behavioral struggles. The Reach Institute says researchers believe that there is a connection between conduct disorder, oppositional defiant disorder and antisocial personality disorder and even a need for anger management. More males than females are diagnosed with conduct disorder and African-American youth in America are diagnosed more often than whites or Asian Americans. The most effective treatment is Multi systemic Treatment (MST), which seeks to analyze the individual’s misconduct in his environment and break negative reinforcements. Attention Deficit Hyperactivity Disorder research papers discuss the causes of ADHD. Treatments of ADHD - Treatments associated with the management of Attention Deficit with Hyperactivity Disorder (ADHD) have been controversial in recent times. Anger Management for Children Research Papers delve into the causes of anger in children, and how to help them through it. Adolescent Substance Abuse term papers on the sociological aspects of treatment and counseling for young people with Abuse issues. Order a research paper on Adolescent substance abuse from Paper Masters. Juvenile Crime research papers -Research papers on juvenile crime will be able to illustrate that the juvenile justice system in the United States is deeply flawed. Juvenile Prison Systems in the U.S. research papers examine the criminal systems problems, bad press, and lawsuits. Paper Masters writes custom research papers on Conduct Disorder and examine the psychological disorder characterized by a persistent pattern of antisocial behaviors and is often seen as a precursor to antisocial personality disorder.